McGraw-Hill Book Company. Hardcover. B0000CKD24 New Condition. . New. McGraw-Hill Book Company. Hardcover. B0000CKD24 Like New Condition. . Fine. NY: McGraw Hill. Very Good- in Poor dust jacket. 1959. First Edition. Hardcover. The color is worn from the tips of the fore corners and the top/bottom of the spine, but nowhere is the cloth worn through to the boards. Binding is clean and sound. Name on ffep, writ small in red ik. Contents are clean and unworn, with no writing or other entries in the text. DJ is badly worn, torn, with a large piece missing. The flaps are complete, so most of the information is still present. (LR-4-D) . ; First Printing of the FIRST EDITION, 1959. 8-1/2" Tall, map endpapers, VIII + 282pp. Black and medium blue boards, bright silver spine lettering. TRUE ADVENTURE. "In 1915, a thousand miles from the South Pole, surrounded by nearly a million square miles of pack ice, twenty-eight desperate men began to haul supplies and personal possessions from their crushed, sinking vessel, the proud ENDURANCE. But in the wasteland around them, the one place left to pitch camp was an ice flow which was itself gradually crumbling away. Nobody else knew the ENDURANCE was in trouble, radio being useless. Sir Ernest Shackleton's' brilliant command of the diverse sailors, scientists, and officers under his command, and his defvotion to the little party he held togerther and led back to the world make ENDURANCE a superb sea adventure. It is also a penetrating study of a great explorer and an incomparable leader of men. " Double-page b/w photo is part of the title pages. 12 pages of b/w photos. (LR-4-D) . .
NY: McGraw-Hill, (1959) Book Club edition.. 8vo. viii+282 pp. Illus from photos. Map endpapers. Boards. A good sound copy in dustwrapper with some edgewear..
Lansing, Alfred. Endurance. Shackleton's Incredible Voyage. Carroll & Graf paperback, 282pp, vgc. Shackleton's astounding voyage, on which no one died. Wheaton, Illinois, U.S.A.: Tyndale House Pub, 1999. Book. Good. Soft cover. FiFTH PRINT. 8vo - over 7¾" - 9¾" tall. WHITE SOFTCOVERS. 247 PAGES. FORMER OWNERS NAME TORN FROM FALSE TITLE PAGE. PAGES 90-110 HAVE A LIGHT WAVE TO THEM AT THE BOTTOM EDGE. TEXT IS CLEAN, BRIGHT AND SECURE. Tyndale House Pub. 1999, FIFTH PRINT. 8vo - over 7¾" - 9¾" tall. Tyndale House, 1999. Paperback. Like New. Looks unread, minor shelf wear on cover. Acceptable. Ships SAME or NEXT business day. We Ship to APO/FPO addr. Choose EXPEDITED shipping, receive in 2-5 business days. See our member profile for customer support contact info. We have an easy return policy. Hardcover. Good. No dust jacket. Good used condition, shows average signs of use or wear for its age. Ships fast & secure, expedited available! Reader's Union, 1961. 1961 Edition. hardcover. 269pp, light sunning to spine, owner's signature, Good+. 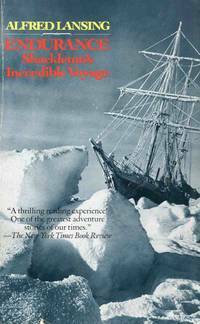 The order to abandon ship was given at 5 p.m. With these words Alfred Lansing begins his amazing account of the Imperial Trans-Antarctic Expedition in 1915.. Glacier Books are experienced and professional booksellers. We take pride in offering carefully described books and excellent customer service. Carroll & Graf Publishers. Used - Very Good. Great condition for a used book! Minimal wear. Carroll & Graf Publishers. Used - Very Good. Ships from Reno, NV. Great condition for a used book! Minimal wear. 100% Money Back Guarantee. Shipped to over one million happy customers. Your purchase benefits world literacy! New York, NY: Carroll & Graf, 1991 Book. Very Good. Soft cover. 8vo - over 7¾" - 9¾" tall. VG/N, pb, used, perfct bound illustrated stiff paper wraps, 282pp. Interior clean and bright, no marks, binding tight. Slightest of shelf wear to wraps, no chips or tears, wraps are clean and bright..
Cupples & Leon. Good with no dust jacket; Some corner wear. Small inscription inside. . Light tanning of pages due to age.. 1918. First Edition. Hardcover. The Curlytops; 248 pages; You can"t really fail with a book about the Endurance. Although Ernest Shackleton"s attempt to make the first Trans-Antarctic crossing barely made it out of base camp, his expedition has gone into the history books as one of the great epics of polar travel. Endurance left England in August 1914 and reached the pack-ice off Antarctica in January the following year. It sank in November, crushed by the weight of the ice, leaving Shackleton and his 27 men stranded in one of the most desolate areas of the world with no hope of rescue. Undaunted, Shackleton led his team to the edge of the ice, dragging three open life-boats that had been salvaged from the Endurance every step of the way. They then sailed to Elephant Island, a remote uninhabited outcrop of rock, where they lived off penguins and seagull. By April 1916, Shackleton realised there was no chance of them being spotted by a passing ship and he and five men set sail in the open-decked 20-foot boat, the James Caird, across 650 miles of the stormiest seas of the southern oceans for South Georgia. After narrowly surviving being shipwrecked on the reefs surrounding the western coast of South Georgia, Shackleton then proceeded to make the first-ever crossing of the mountainous island before reaching the sanctuary of the whaling station at Stromness. And it was Shackleton, in person, who led the rescue mission to Elephant Island to pick up the rest of his men. Miraculously, all 28 men survived. . Condition: Good with no dust jacket; Some corner wear. Small inscription inside. Light tanning of pages due to age. Naval: Carroll & Graf Publishers, Inc., 1998. 282 pgs.,. Soft Cover. Very Good. 8vo - over 7¾" - 9¾" tall. Military Biographical: Carroll & Graf Publishers, Inc., 1997. 282 pgs., Cover has some wear, couple of tiny edge tears. Good reading copy.. Soft Cover. Good. 8vo - over 7¾" - 9¾" tall. McGraw Hill Co, 1959-01-01. Hardcover. Good. This is not an import but printed in the USA!! The dust jacket is quite smudged with shelf wear, creasing, and some open and closed tears. There is some light tanning/foxing to the outer edges of the pages due to age. The pages of this book are clean and unmarked. FAST SHIPPING & FREE TRACKING!